How manifold it is, what thou hast made! They are hidden from the face. 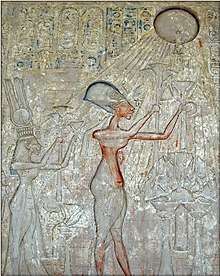 Akhenaten, also spelled Akhenaton, Akhnaton, Ikhnaton, or Echnaton (meaning "Effective Spirit of Aten"), and known before the fifth year of his reign as Amenhotep IV (sometimes given its Greek form, Amenophis IV, meaning "Amun is Satisfied"), was a Pharaoh of the Eighteenth dynasty of Egypt, who ruled for 17 years and died in 1336 BC or 1334 BC. He is especially noted for abandoning traditional Egyptian polytheism and introducing worship centered on the Aten, which is sometimes described as monotheistic or henotheistic. 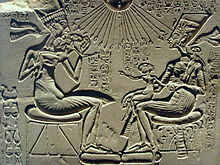 Later official language avoids calling the Aten a god, giving the solar deity a status above mere gods. They are hidden from the face. Without the basis for proper diagnosis, the charge of madness is best avoided … but clearly Akhenaten had an original mind. He developed a vision of how God should be honoured, and had the determination and means to turn that vision into reality. For my money, this makes him the most fascinating and controversial figure in Egyptian history. Akhenaten’s temples incorporated vast open-air courts with offering tables and unroofed shrines. The cult image, of course, was no longer a statue hidden deep in the sanctuary, but the Aten above.